At last!!!!! 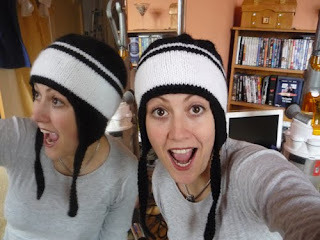 If like me, you have spent ages trawling the net for a hat pattern that does not require circular needles or the dreaded DPNs (yanking out clumps of your hair in the process) then you have come to the right place! I have taken all the best bits from the patterns I have found and made the ultimate - only two sticks required - hat complete with ear flaps! It seems only fair to share it and hope that it saves others like me any further hair loss. Finished Circumference 19¼ (20¼, 22¼) inches. Note: The numbers in brackets are for the bigger sizes! Where you see one number, it applies to all sizes. 5mm Needles. Yup, that's it; just 1 pair of 5mm needles - can you believe it?!!! Chunky wool in whatever colour you would like. The pattern is written as if it's all one colour - just change wool wherever you would like to add stripes of colour. The design also works in Aran with no need to change size, though it makes a thinner hat. Cast on 3 sts. Work in k1, p1 rib until you have an 8 inch length for the tie. Row 1: inc1, K1, inc1 – 5 sts. Row 3: inc1, K3, inc1 – 7 sts. Row 5: inc1, K5, inc1 – 9 sts. Row 7: inc1, K7, inc1 – 11 sts. Continue as established, increasing 2 sts of each row until there are 23 sts; ending on a WS row. Slip stitches onto a spare needle or holder. Make a second Earflap the same, adding this to the spare needle/stitch holder. Cast on 6 (8, 10) sts then knit across 23 earflap sts. Then cast on another 19 (19, 23) sts, knit across 23 stitches of second earflap and then cast on 6 (8, 10) sts – 77 (81, 89) sts. Work even in St st until piece measures 5 (5½, 6) inches above joining row, end with a RS row. Next Row: Purl, decrease 5 (1, 1) sts evenly across row – 72 (80, 88) sts. Row 1 (RS): *K6, k2tog; rep from * across row – 63 (70, 77) sts. Row 2 and WS rows: Purl. Row 3: *K5, k2tog; rep from * across row – 54 (60, 66) sts. Row 5: *K4, k2tog; rep from * across row – 45 (50, 55) sts. Row 7: *K3, k2tog; rep from * across row – 36 (40, 44) sts. Row 9: *K2, k2tog; rep from * across row – 27 (30, 33) sts. Row 11: *K1, k2tog; rep from * across row – 18 (20, 22) sts. Row 13: K2tog across – 9 (10, 11) sts. Row 15: K2tog across, end k1 (0, 1) – 5 (5, 6) sts. Cut the wool, leaving a good length tail; enough to sew down the seam. Thread the tail through remaining sts and pull tightly together to secure. Sew him up and slap him on yer head!!!!!!!!!!! Beautiful. Thank you so much Kat for this pattern! I can't afford circulars and my Walmart doesn't sell dp's anymore. I'm constantly trolling the net for two-stick patterns. Thanks! Thanks so much for the pattern. I've made one for a friend who is training for a mountain walking challenge, however I love it so much I'm about to start one for myself. PS we share the same name... even surname..even spelling.... ! Glad to have found this pattern! I prefer knitting hats with two sticks and can't wait to try this one out. Thanks for sharing! Thank you for this pattern - I'm a "pit knitter" as this is the only way that I can hold my tension consistently. I have access to some homespun wool, which is not "classified" as to DK, chunky, etc. What is the gauge - How many stitches per inch/mm do you get using the 5mm needles? Fantastic Kat! !- you solved my dilemma - I needed this 2 stick had pattern for a friend who hasn't yet tried circulars, but wants so badly to make a nice ear flap hat - You are the answer - thank you so much!! I used your hat pattern (knit in the round though) to make this great alien hat for my daughter. www.bluebobbin.blogspot.com Thanks! thank you so much, i do however like to use circular needs, but have as of yet to knit in the rounds and do not like dpns at all. thanks for making a pattern with single pointed needles, so i can keep all my hair! nice job, beautiful hat! How in the world do I end the ear flaps? Do I just make a tail?? Oh, and what side is the wrong side? You never say. Or is it always the even rows? Thanks so much for this. I hate to say it, but I have been knitting for quite some time and have never bothered learning how to use DPNs. I am always looking for patterns and books that require straight needles. So, hats of and danke very much!!! Hello how many yards/grams of yarn did you use for this? I want to make a larger size hat so I am trying to figure out how much yarn I need! Thanks! I love this pattern! Thank you so much for putting this out there! I was getting so discouraged trying to find one! Do you think you'll make a cable stich pattern in the same style hat?